Home - Knowledge Base - Is Blue Apron Worth It? For years, Blue Apron has been one of the most popular meal delivery services in America. However, after the company went public in the summer of 2017, its shares dropped almost 50 percent in just a few months and it seemed like the service was not too likely to return to its former glory. Fortunately, Blue Apron is a huge family of dedicated professionals who love what they do and they bounced back rather quickly after this rather heavy blow. Now, the service offers even more perks than before. 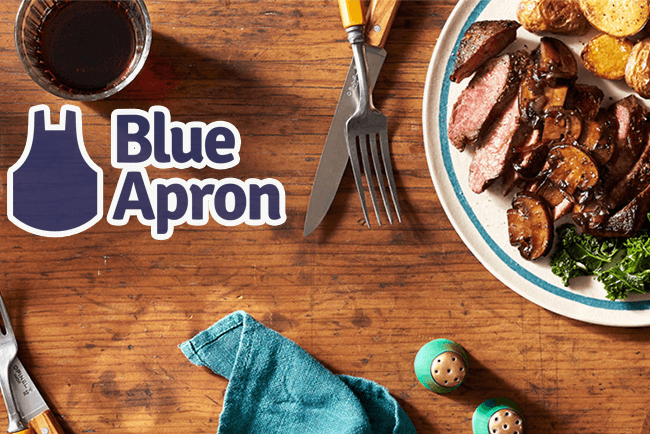 In this post, we will highlight all the wonderful features that make Blue Apron meal kit service a first-class choice for home cooks around the nation. Blue Apron offers some of the most innovative recipes that we have seen in all our years of reviewing meal kit delivery services. It never fails to impress, it makes haute cuisine a breeze, and all of its recipes are easy to follow and take just around half an hour. This popular service is famous for the variety of its dishes. Every week, there are as many as 22 recipes on the menu, divided into 4 sections. The recipes in each section are available with 1 of the 4 meal plans designed for omnivores, vegetarians, and those who want to maintain a healthy weight. The dishes range from comforting street food favorites to healthy, Mediterranean-style meals. Thus, whatever your preferences may be, you are sure to be delighted by the diversity of meal ideas available every week. The service uses organic and sustainably sourced produce, hormone-free, antibiotic-free meat, and sustainable and wild caught fish and seafood. Everything you receive is perfectly fresh and premeasured, so there is no waste and the prep time is much shorter. Subscriptions are extremely flexible. You can modify your plan, skip a delivery or end your subscription whenever you wish. Blue Apron has its own wine club, so you can easily order wines that perfectly go with your meals. Turn your meal into a romantic dinner in just a few clicks. Blue Apron meals for 2 people cost $9.99 per serving. Meals for 4 people cost between $7.49 and $8.99, depending on the number of recipes you order. Considering that what you get are fresh, fragrant, and scrumptious culinary masterpieces, the prices are more than reasonable. Shipping is free unless you order 2 recipes for 2 people, in which case you pay a $7.99 shipping fee per delivery. Still, even with the additional shipping costs, the total cost is more than justified by the quality of the kits. Bottom line: if you want to cook like a pro chef, use nothing but the finest ingredients, spend less time in the kitchen with much more impressive results, enjoy maximum convenience, and broaden your culinary horizons, Blue Apron is a perfect choice for you.